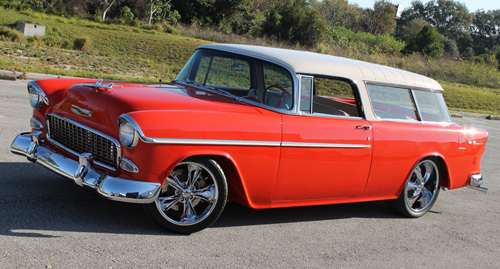 This gorgeous ’55 Nomad has been rehabilitated for show and go! After looking at the cracking lacquer paint of more than 25 years, I decided the Nomad needed another frame-off restoration. My plan was to give it new paint as well as upgrade the engine, suspension, and interior. The first thing I did was take the Nomad to Master Blaster in Orlando, FL. They did a great job of stripping the paint. When I first saw the car in bare metal, I could not believe what fantastic shape it was in. There was no rust or dents on the all-original, pristine sheet metal. After picking up the car, I dropped it off at the Paint and Piston Body Shop in Ft. Myers, FL the same day to let Dale do his magic. We separated the body from the frame so I could take the frame to my shop to start the modifications. I had Eaton Spring build some custom rear springs to lower the rear about three inches. The front was upgraded with tubular A-arms and coil over shocks. Next, I filled and smoothed the frame, added Delphi 600 power steering and Baer brakes to the front and rear. Dale and I started with Gypsy Red paint and tinted it with a red toner until we got the color we wanted. We finished off the frame and body with this paint. 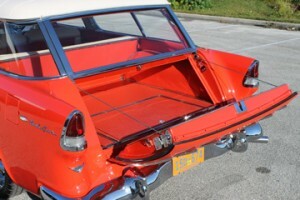 The top was painted with Shoreline Beige (Gypsy Red and Shoreline Beige are both ’55 Chevrolet colors). The engine had not been touched in over 25 years either. I freshened up the bottom end and then added new aluminum cylinder heads, a March serpentine belt system, ceramic coated stainless steel headers and exhaust, and MSD ignition. 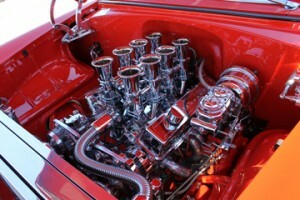 I really like the look of the old gassers with Hilborn eight stacks, so I contacted Inglese about an electronic fuel-injection system for my engine. We came up with a plan and decided to chrome plate the entire system. Plumbing everything and modifying the Nomad fuel tank for an in-the-tank fuel pump were certainly challenging. I have a couple of 1955 promo pictures on the wall and I have always liked the way the tires filled the wheel well openings. After playing around with the stance of the car and comparing the original tire look, I ended up with 18 inch front and 20 inch rear Foose Legend wheels and 225/45R18SC front and 275/35R20SC rear M/T tires. Same look with a modern spin– forgive the pun! The waffle design of the Nomad interior is something I have always liked, so I just freshened it up with new carpeting and seat foam. Since the engine changes required more information feedback, the old gauges were replaced with a Classic Instruments cluster. 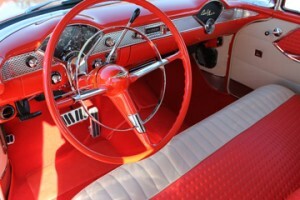 To make driving more comfortable, I also added Vintage Air and power windows. After 18 months, the Nomad is ready for another 25 years of cruising, showing, and talking to all of the great people in the Classic Chevy family.